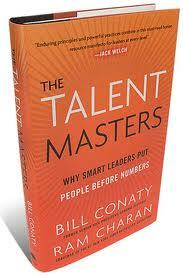 Purpose, role, and communication skills stand out for me as fundamental for remarkable leadership. 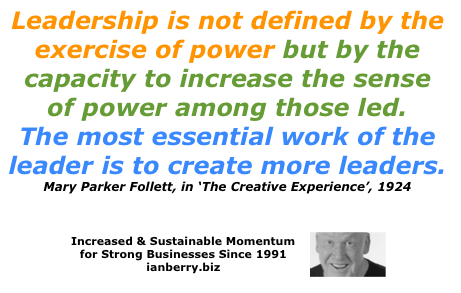 Almost 100 years ago Mary Parker Follett nailed the true purpose of real leadership for me. Purpose (why, intention, reason) precede role. The enlightened CEO recognizes that his top priority for the future is building and deploying the talent that will get it there. Talent is another word for gift. My life’s work is to help business owners and leaders become maestro's of gift/talent enhancement - the number one role of leadership and the key to fulfilling the purpose. To excel at purpose and role real leaders are forever improving their communication skills. This means a presence 1:1 and in small and large groups. How can I do better in fulfilling the purpose and number one role of leadership? What more can I do to be a remarkable communicator 1:1 and in small and large groups? What suggestion do your have for me that will enable me to better fulfill the purpose and number one role of leadership? What suggestion do you have for me that would help me to become a better communicator?